We have aggregated Castelo/Alfama/Mouraria, the oldest nuclei of this city, in order to show you what most typical, picturesque and historical Lisbon has to offer. 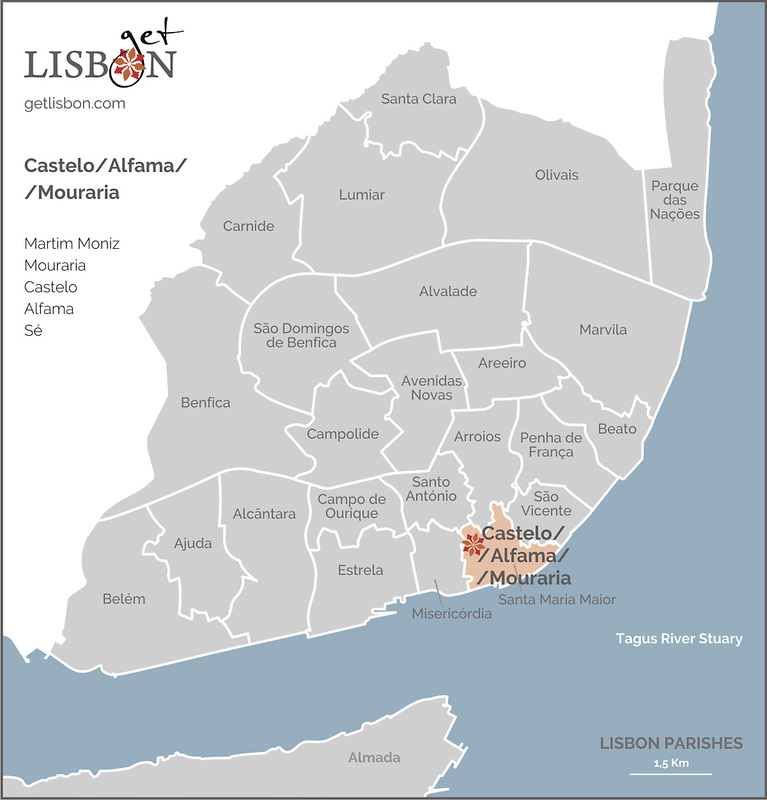 Let’s start the route Castelo/Alfama/Mouraria with the nucleus of Castelo. The S. Jorge Castle is located at the top of the highest and, still today, the most easily identifiable hill of Lisbon. Its name, S. Jorge, owes to King João I (14th century) to evoke the patron saint of the knights and crusaders. However, the occupation of this place was much earlier, it goes back to the Roman period. The castle’s walls and the roman citadel were recovered and enlarged by the Muslim, around the 7th century, originating the called Cerca Moura (Moorish wall). This wall was absorbed by the Cerca Fernandina (wall of King Fernando), seven centuries later, resulting in a much wider wall. Throughout the times, the Castle had several roles. It was the Paço Real, place of residence and acclamation of the kings, from the 13th century until the reign of Manuel I in the 16th century. It was also here that the national historical archive, the Tombo, was kept, until the 19th century. Today, the Castle is a must-visit touristic place, the heart of museums and a stage for cultural events. 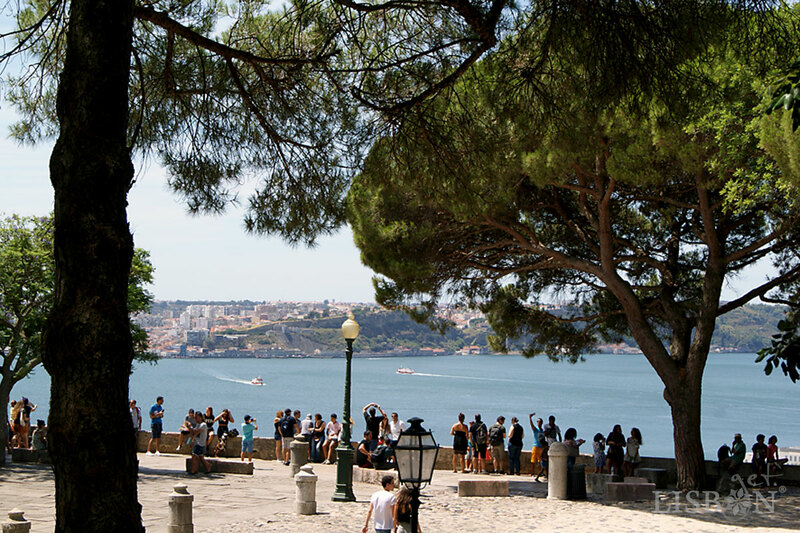 From there, you can see the most beautiful panoramas of Lisbon, the Tagus River and the South bank. The place where we can see the whole Alfama at our feet is, without a doubt, in the two viewpoints Santa Luzia and Portas do Sol, always full of tourists and curious people in a constant frenzy. However, if we venture into the intricate streets we will end up coming across the frontcourt of Santo Estevão Church, and here we’re surprised by the tranquillity that invites us to plunge our gaze into the Tagus River. 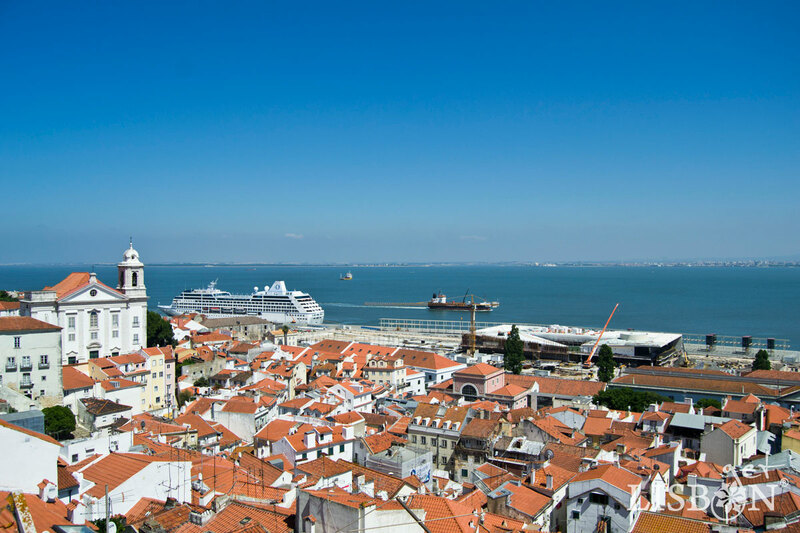 Alfama is the oldest housing nucleus of Lisbon, situated outside the old Moorish wall in the east-facing suburbs. It preserves, until today, the characteristics of an Arab neighbourhood with narrow streets, alleys and steps that lead us from the castle to the river. The Arab origin of its name, al-Hamma, fountains and baths, reveals the abundance of spring water available, reason why the peoples settled down in this area of the city. Even today, we can observe numerous fountains from the top to the base of the slope, as well as structures dedicated to baths that used to work until the first decades of the 20th century. Regarding architecture, we easily surround ourselves by typical old houses and adufa windows, protruded windows in Moorish style. We are surprised by palaces disguised behind moderately discrete facades, by churches and, of course, restaurants and casas de fados (restaurants with fado performances). Furthermore, it is through these ancient streets that processions and popular manifestations are held, attracting thousands of people during the celebration time. Here, the hustle and bustle are made by local people, descendants of fishermen and sailors, and by the visitors who walk through these streets with dazzled eyes and hearing guitar chords. Leaning against Alfama and before entering Mouraria, we have the unavoidable area of Sé. Its centre of attraction is undoubtedly the old Church of Santa Maria Maior, ordered built by King Afonso Henriques in the same sacred location of previous occupations. Just in front, in the precise place where the most devout saint of the world was born, is the church of Santo António, patron of the heart of the population of Lisbon. Right next to it, there are two must-see museums, Santo António and the other Aljube – Resistance and Freedom, an old building that crossed many epochs and different uses. It was in the 20th-century a political prison and now, where the permanent exhibition is the testimony of oppression and anti-fascist resistance. On the northern slope of the hill of the Castelo, we can find Mouraria, a neighbourhood where some of the most famous fadistas (fado singers) started their careers. Until 1170 Mouraria was an unoccupied peripheral and unhealthy zone. This was the space that the victorious King Afonso Henriques attributed to the defeated Moors that chose to remain in the city. Here they developed their agricultural, craft and commercial activities, such as pottery and carpets manufacture. In the 19th century, this neighbourhood of narrow and labyrinths streets was characterised by poverty, bohemian lifestyle and fado. In the 1940s, it suffered a real earthquake when the demolition of the lower part of the neighbourhood happened. From its old houses, an abandoned palace, a church and an event venue, only the small Chapel of Nossa Senhora da Saúde remained. Modernity wanted to extinguish this degraded area, but the project has not been completed, and from it only remained Martim Moniz Square. A square too large to be easily inhabited again, it was left as an open wound in the heart of a sad neighbourhood. This blow will be recorded in the lyrics of the fados that mourn this loss. 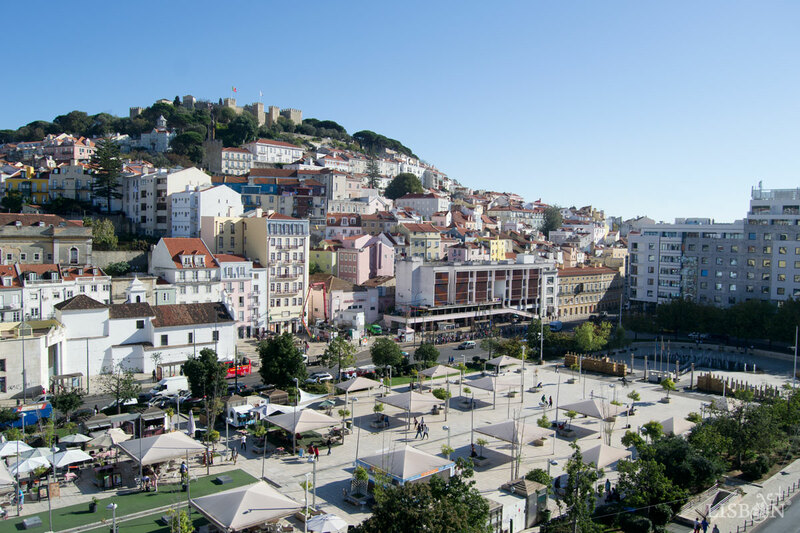 For some years now, the Lisbon City Council and the Renovar a Mouraria Project (renovate Mouraria project) have successfully played a key role in the rehabilitation of this part of the city. It has always been deeply marked by multiculturalism and still today, it is characterised by the occupation of people of diverse origins, crossing different religions and cultures of about 92 nationalities. Discover the rich history of this multicultural Lisbon, venturing with us in the area of Castelo/Alfama/Mouraria!